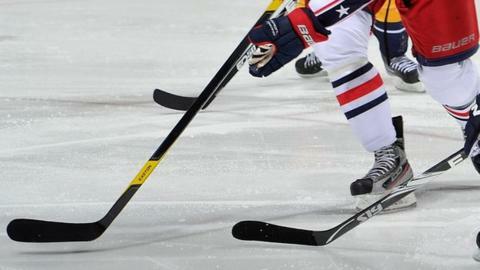 Stand-in Edinburgh Capitals keeper Craig Holland was the hero as the Murrayfield side secured a hard-fought victory against Hull Stingrays. The 19-year-old was thrown into action after Tomas Hiadlovsky incurred a hefty five-game ban at Hull on Saturday for kicking with his skate. But Holland did his team proud as he won man of the match, despite losing a couple of goals in the opening few minutes of Sunday's rematch. Janis Ozolins put the Stingrays one up within 60 seconds when he squeezed the puck in at Holland's near post. Then the Latvian added a second, tapping home from close range and at that point it seemed a long night was on the cards. But the home team rallied and responded when Frazer Goldie got a touch on Michal Dobron's smashed shot from the blue line, leaving Hull keeper Ben Bowns helpless. Rene Jarolin equalised with a soft shot that went through Bowns's legs early in the second period. Dangerman Jarolin finished a great team move to put Edinburgh ahead, set up by Jade Portwood, but a bullet shot from Chris Sykes pulled Stingrays level again after two periods. Neither team could find a way though in the third, taking the game to overtime, but again the five-minute sudden death extra time failed to yield a winner. It was up to the lottery of penalty shots after Dominic Osman saw his stopped by Holland; responsibility fell to Dobron, who clinched the two points as he finished his. Afterwards, Caps hero Holland admitted he was nervous going into this match, but reckoned his confidence grew as the match progressed. He said: "After being flung into action on Saturday and knowing I was playing on Sunday, I didn't get much time to prepare and you could see the nerves as we lost two soft goals. "My confidence grew as the game went on, though, and all I could do was keep my chin up and take things a step at a time. It's a big win for us." Proud Caps player-coach Richard Hartmann said: "I'm delighted for Craig as he hasn't played too much, but he played well, as did the whole team. "Craig knows he has my full support and I knew he didn't need me to say anything to him before the penalty shots. He did the best for us tonight."